This Rio Mar Luxury 2 bedroom Ocean Villa is for anyone with a need for relaxation and a desire for that resort life, and it’s name pretty much sums it all up: luxury plus an oceanfront location equals this awesome stay. It has everything you need with 2 bedrooms (the master room with a king-sized bed and the second room with one full/one queen) and en-suite baths, a fully equipped and open kitchen, a decked out living area, and a balcony with spectacular views of the Wyndham golf course and shoreline. For entertainment, there is something for everyone from a Kid’s Club program to water and land sports (two golf courses? Yes please!) to nightlife activities like restaurants, casinos, and lounges. In just 2 minutes of walking, you seriously get it all! Located in the new building overlooking the golf course and the beach. Our Luxury Ocean Villa at the Wyndham Rio Mar Resort is an elegantly appointed 2 bedroom/ 2.5 bath with an open floor plan and expansive beach views. This oceanfront property is located on the 5th floor of the building (with elevator) and features imported tile floors throughout, a modern and Italian open kitchen with stainless steel appliances (including dishwasher), granite counter-tops, a dining table for 6, one modern living room with a 42” plasma screen TV, and a covered balcony with extra seating and beautiful beach and golf course views. The master bedroom has a king size bed, an en-suite bathroom, a walk-in closet, one 32” plasma TV, and a “Juliette” balcony. The second bedroom offers a full-size and queen-size bed, an en-suite bathroom, a walk-in closet, and a 32” plasma TV. The property is fully air-conditioned and also offers ceiling fans throughout in case you want to enjoy the nice ocean breeze. Additional amenities include a washer & dryer as well as an inflatable queen-size mattress, complimentary wifi, a blue-ray/ DVD player, and cable TV. Some villas also have sleeper sofas. The property is oceanfront and within the grounds of the 500-acre security gated community of Grand Wyndham Rio Mar Beach Resort, Spa, and Golf Club. The resort offers a 2 mile-long beach, pools, restaurants, bars, a casino, a spa, two 18-hole championship golf courses, and 13 tennis courts, among other activities. The resort is also located close to El Yunque Rainforest, the Bioluminicent Bay, and the Ferry docks to Vieques and Culebra Islands. * Special Rate Requirements for Holidays may apply- Presidents Day, Easter, Spring Break, July 4th, Thanksgiving, Christmas, New Year. 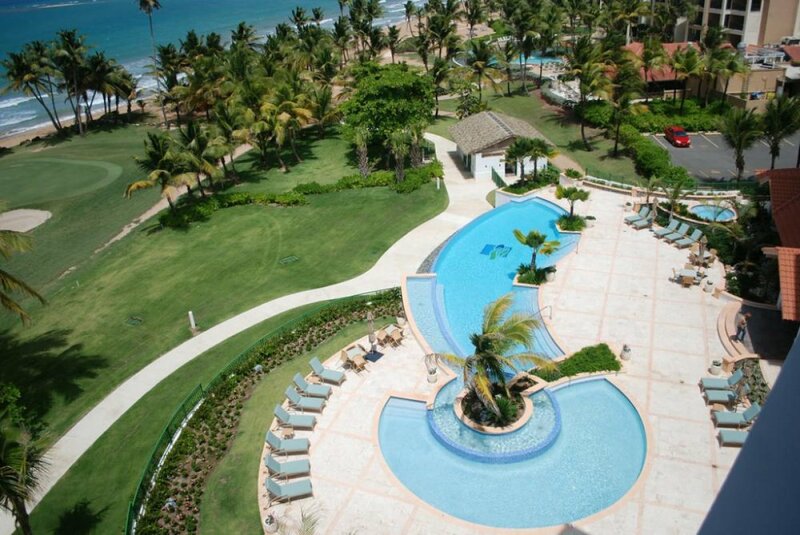 The villas are beachfront, located at the Wyndham Rio Mar Beach Resort - 30 feet from beach. A villa chauffer is available to pick you up at the airport and transport you to the villa for $75 (1 - 4 persons by van; $20/per person over 4) or $120 Lincoln Town Car (1 - 2 or 3 persons - with light luggage and no golf clubs). If you have rented a car, you will go directly to your rental car agency counter at the airport, where you will be provided with a villa packet containing keys and directions to the villa. Taxis at the airport charge $90 for transportation to the villa. All ages welcome - Babysitting referrals, Kids' Club program, Children's Pool, Playground Area, Arcade/Game Room all located on the resort property. Daily maid service $70/day or $270/week additional; Crib rental $20/night; Roll away beds $25/night; Cook available upon request. PERFECT!!! Easy Living in Paradise! From the pictures of the Condo, we were expecting it to be “very nice” BUT we were totally pleased to find it just PERFECT. From our arrival, the parking is so convenient with assigned spots and very close to the elevators for the luggage. We opened our unit to a gorgeous view of the Sea from our living room and balcony. The layout of the condo is extremely nice and a lot of thought must have gone into the plan and the decorating. The space has been used to give lots of room and a nice division of areas. This unit was spotless, music playing when we arrived and very ample bedding and towels. The kitchen is delightfully set up and the large table with benches on both sides could have set 6-8 people easily. We really appreciated the small laundry room with a washer/dryer which looked like it had never even been used. My grandson loved his own private space in the 2nd bedroom with his own lovely bathroom. My daughter and I enjoyed the Master Bedroom. It is a huge king bed and a BIG bath and dressing area. Our only problem was having to leave! So hard to fly back home from such a lovely setting. I can’y say enough nice things about Sharon @ WhereToStay.com consultant! She is highly organized, efficient as well as so friendly, I felt I had known her forever. She always answered my emails promptly and she was full of good ideas of places to go and good restaurants.